A shared eco-system involving all stakeholders provides effective information pathways and promotes a more inclusive, flexible, and dynamic marketplace. This image illustrates an early mapping of Canada’s wireless ecosystem. 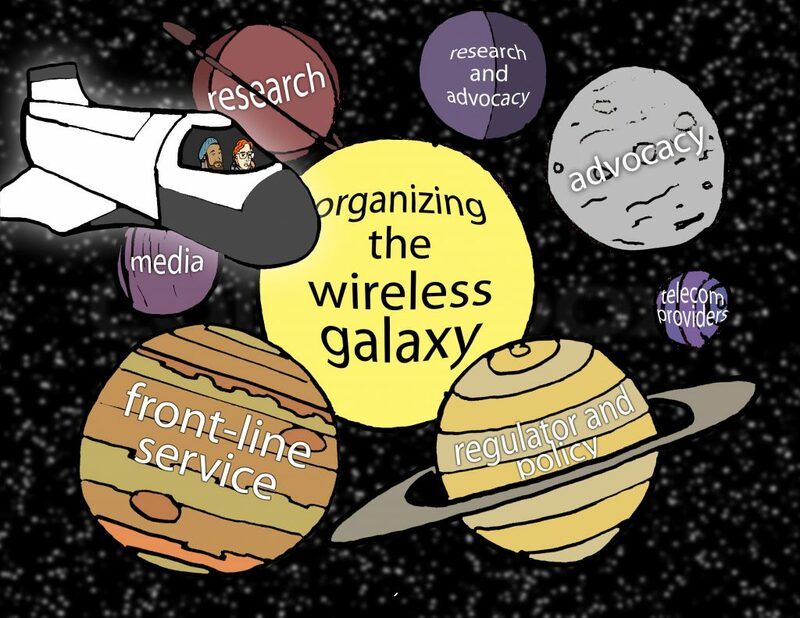 Our work to date confirms that there is a vast, diverse landscape of organizations involved in some aspect of consumer access to information regarding wireless telecom services. We have identified over 70 organizations across Canada that can be clustered according to these planetary spaces. At a face-to-face roundtable of many of these actors, we heard about the challenges for consumers because this landscape is so wide and diverse. Each cluster has a role to play in in providing access to information regarding wireless services for Canadian consumers. However, consumers, themselves, individually and collectively are the least knowledgeable of the information, knowledge and support embedded in this ecosystem. One of our primary research goals is to strengthen this ecosystem by deepening and widening the knowledge and information sharing and leveraging existing collaboration and partnerships. Our work also suggests there is still un-tapped potential to strengthen roles and relationships among many of these wireless and telecom information intermediaries.